Turkish armoured personnel carriers (APC) maneuver during a military exercise near the Turkish-Iraqi border in Silopi, Turkey September 26, 2017. ERBIL/ISTANBUL, Iraq - Turkey threatened potentially crippling restrictions on oil trading with Iraqi Kurds on Thursday after they backed independence from Baghdad in a referendum that has alarmed Ankara as it faces a separatist insurgency from its own Kurdish minority. Iraq’s Kurds endorsed secession by nine to one in a vote on Monday that has angered Turkey, the central government in Baghdad, and other regional and world powers, who fear the referendum could lead to renewed conflict in the region. Most oil that flows through a pipeline from Iraq to Turkey comes from Kurdish sources and a cut-off would severely damage the Kurdish Regional Government (KRG), which relies on sales of crude for almost all its hard currency revenues. So far the oil pipeline is operating normally despite Turkish threats to impose economic sanctions on the Kurdish autonomous region in Iraq. 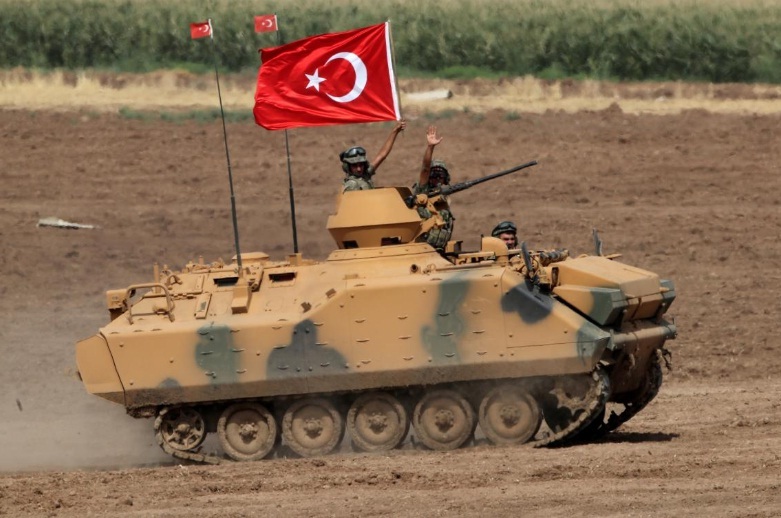 Turkish officials, however, ramped up pressure on the Kurds on Thursday. Yildirim said Turkey would respond harshly to any security threat on its border after the referendum, although that was not its first choice. Yildirim also said he agreed with Abadi to coordinate economic and trade relations with the central government in Baghdad. He said Turkey, Iran and Iraq may meet to discuss the referendum. Turkish government spokesman Bekir Bozdag said Turkish armed forces would stop training Iraqi Kurdish peshmerga forces, which protected oil fields from capture by the Islamic State. With the region’s largest Kurdish population, Turkey has been battling a three-decade insurgency in its largely Kurdish southeast and fears the referendum will inflame separatist tensions at home. But travel to the Kurdish region will become harder if airports in Erbil and Sulaimaniya are closed to international flights. Their autonomous region in Iraq is the closest the Kurds have come in modern times to a state. It has flourished amid Iraq’s civil war but may struggle to maintain investment if it is blockaded economically. Kurdish officials say that Abadi’s tough response to the referendum vindicates Iraqi Kurdish leader Masoud Barzani‘s decision to hold the referendum because they believe Baghdad will not cooperate under any circumstances. The officials feel that if Baghdad, Turkey, Iran, the United States and the world line up against them, and the Kurds cannot see an end to their hardship, Barzani could come under pressure at home to declare independence. A diplomatic drive to forestall Monday’s referendum failed to persuade Kurdish leaders, some of the United States’ closest Middle Eastern allies, former U.S. officials and experts said. There were expectations that the United States, which said it would not recognize the vote, could use its ties to the Iraqi Kurds to persuade Barzani to cancel the referendum in exchange for a guarantee of talks with Baghdad. The U.S. bid to stop the referendum failed, experts said, in part because the aging Barzani sees fulfilling aspirations for an independent Kurdish state as his legacy. Baghdad has heaped pressure on the Kurds, demanding they cancel their referendum, while parliament urged the Iraqi government to send troops to take control of oil fields held by Kurdish forces. Baghdad also demanded that foreign governments close their diplomatic missions in the Kurdish capital Erbil. Foreign airlines have begun cancelling flights to Kurdish airports after Iraq said international flights to Erbil and Sulaimaniya would be suspended from Friday. Turkey told its citizens to leave northern Iraq before the ban came into force. Kurdish authorities have rejected Baghdad’s demands that they should annul the referendum and hand over control of their international airports, instead offering to hold talks with Baghdad in an attempt to defuse the airports crisis. Turkish President Tayyip Erdogan and Russian President Vladimir Putin, who have stressed the need for Iraq’s borders to remain unchanged, were due to meet in Ankara on Thursday. Russia’s interest in the region is growing. Oil major Rosneft is increasing investment in Kurdistan and the Kurds have been developing strong ties with Moscow. The Kurds consider Monday’s referendum to be an historic step in a generations-old quest for a state of their own, while Iraq considers the vote unconstitutional. The United States, major European countries and nearby Turkey and Iran all opposed the referendum, which they described as destabilizing at a time when all sides are still fighting Islamic State. Barzani, who is KRG president, has said the vote is not binding, but meant to provide a mandate for negotiations with Baghdad and neighboring countries over the peaceful secession of the region from Iraq. Baghdad has rejected talks. The Kurds were left without a state of their own when the Ottoman Empire collapsed a century ago. Around 30 million live in Iraq, Turkey, Syria and Iran. The Kurds say the referendum acknowledges their contribution in confronting Islamic State after it overwhelmed the Iraqi army. Turkey threatened potentially crippling restrictions on oil trading with Iraqi Kurds on Thursday after they backed independence from Baghdad in a referendum that has alarmed Ankara as it faces a separatist insurgency from its own Kurdish minority.